I keep seeing these gorgeous pumpkin flower arrangements at florists, farmers markets, and online. A collection of blooms tightly packed into a bright orange pumpkin just screams “fall.” It’s an elegant take on fall decorating: setting the table for Thanksgiving dinner, adorning the mantle for the season change, or even to give as gifts. I know I would love to receive one of these gorgeous pumpkins, and they will be just as rewarding to give! With flower arranging, the artistry is in the design and it’s not as easy as it looks. 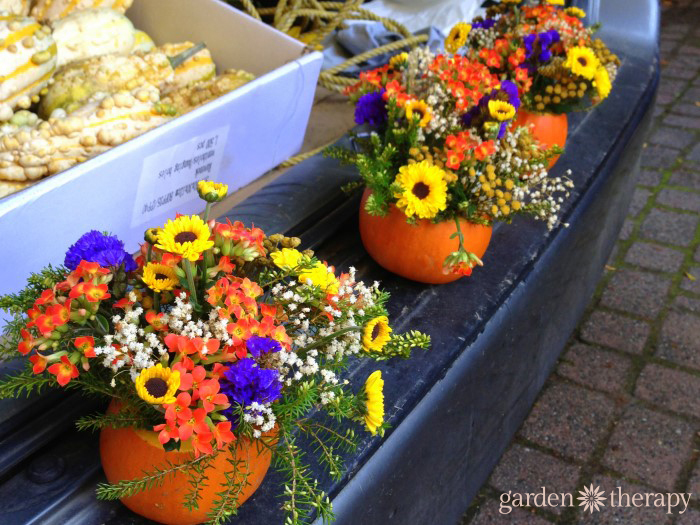 But if you want to take a stab at creating your own pumpkin flower arrangement then here is how to do it. Cut the top off your pumpkin so that you have a fairly wide opening near the center of your pumpkin. Scoop out the guts and make these addictive Roasted Rosemary Pumpkin Seeds. Line the inside of the pumpkin with a sheet of plastic. This will hold some of the moisture in when you water the floral foam. Related: How to Make Planted Pumpkins Last! 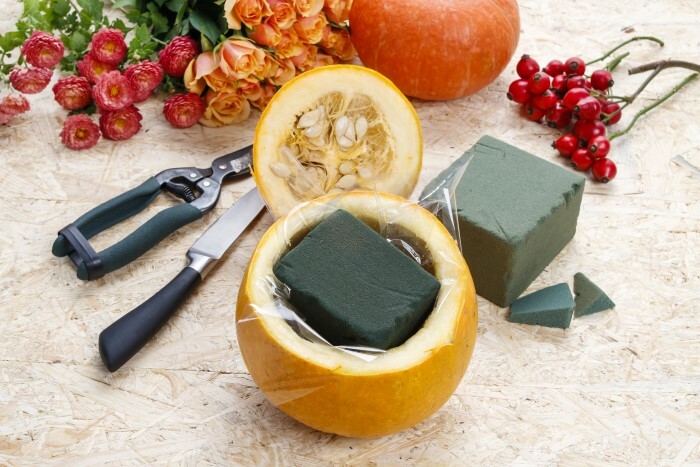 Cut a piece a floral foam with the knife to a size that will fit inside the pumpkin. Soak the foam in water while you prepare your flowers. Choose flowers with strong straight stems that are freshly cut, either from the garden or a purchased bouquet. 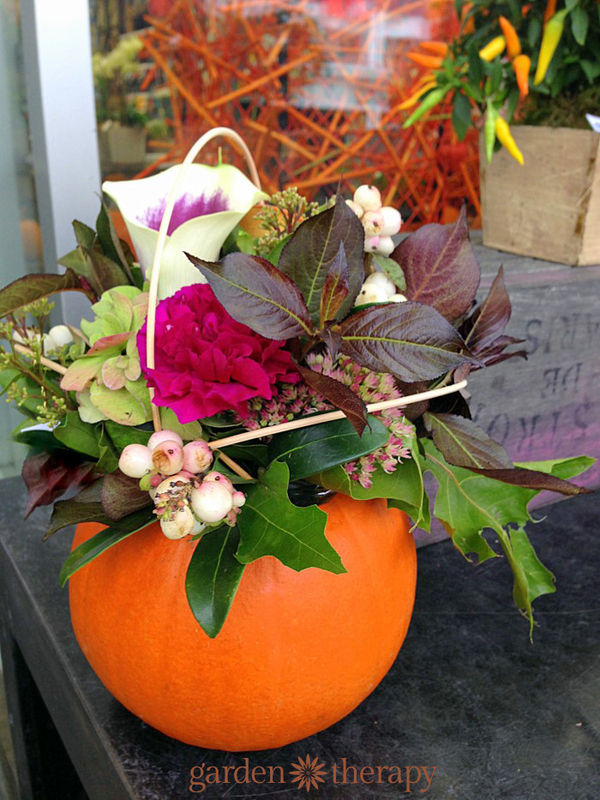 Insert the floral foam into the inside of the pumpkin and create your arrangement. Start with flowers, then add leaves, berries, and other embellishments to create a full and interesting arrangement. 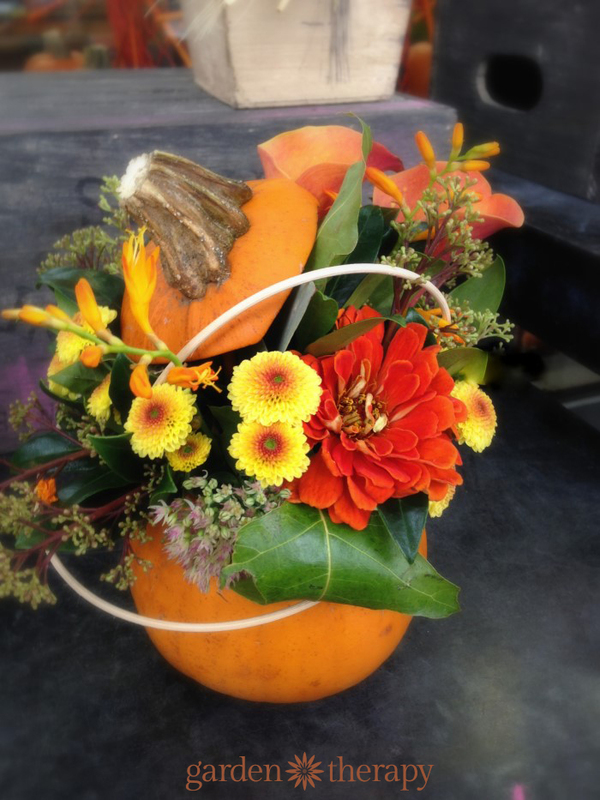 Items collected from the garden will shine in a new way when displayed in a pumpkin vase like this one I spotted at Vancouver florist Flowerz. You can even pop the top like on this other creative arrangement. Hold it on with a piece of floral wire inserted into the floral foam (also from Flowerz). I even made up one with some tender succulents for my garden. 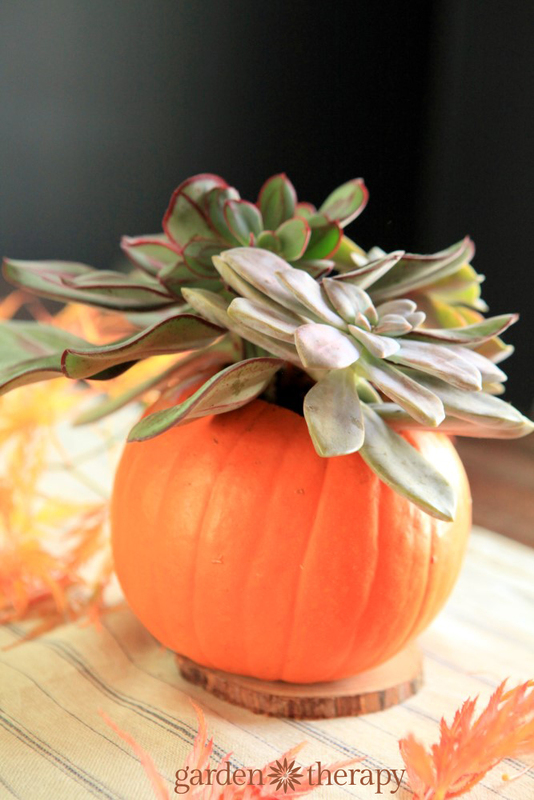 As the weather starts to get cooler, the succulents won’t survive outdoors, so why not bring them in, plant them in a pumpkin, and enjoy them for as long as you can? I didn’t use floral foam for the succulents but instead filled the inside of the pumpkin with indoor potting soil. I do this for my outdoor pumpkins every year. You can see a whole bunch of them here. These pumpkins would also look really great on the table with these burlap and fall leaf candle holders which you can learn how to make here. 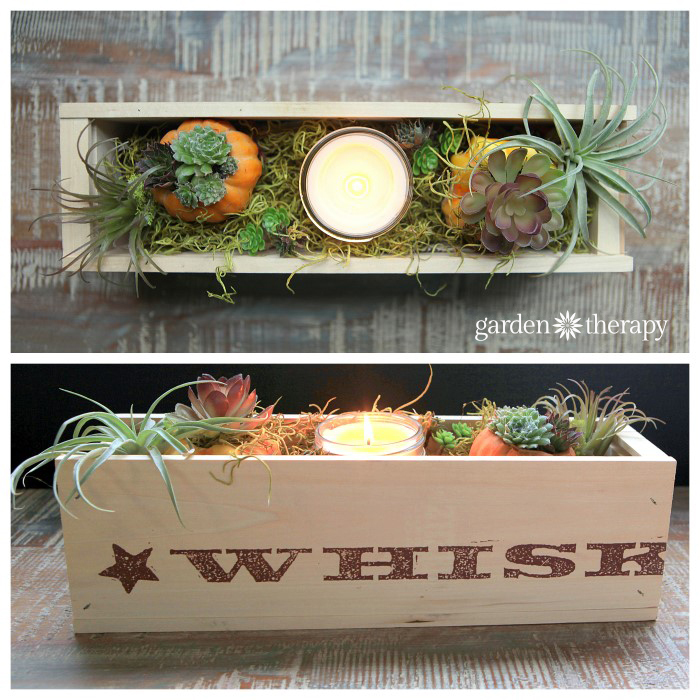 Or with mini pumpkins, succulents, and air plants. How far in advance can the centerpiece be made? I will need to make 12. Hi Darlene, like all fresh flowers, they look best when freshly made, so I would try to make them no more than 1-2 days in advance. The arrangement should then look pretty for another 1-2 weeks depending on the flowers and temperature they are stored at. Thanks for sharing these beautiful projects!! did it this year and last….beautiful arrangements, also gave them a bleach wash before adding the foam/flowers. ….also did outside then applied a thin coat of vaseline…to keept it shiny! ??? ?